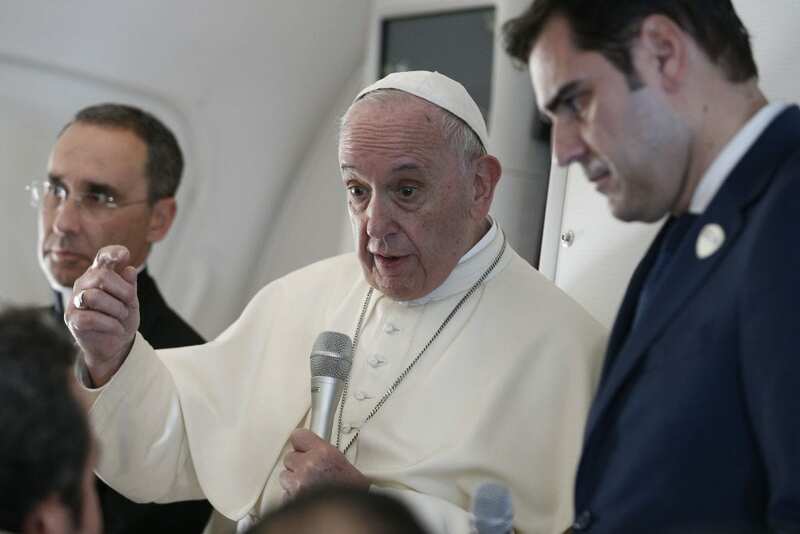 Pope Francis answers questions from journalists aboard his flight from Abu Dhabi, United Arab Emirates, to Rome on 5 February 2019. Also pictured are Msgr Mauricio Rueda, papal trip planner, and Alessandro Gisotti, interim Vatican spokesman. Photo: CNS/Paul Haring. “For me, there is only one great danger at this moment: destruction, war, hatred among us,” the Holy Father said, explaining why he and Egyptian Sheik Ahmad el-Tayeb, grand imam of al-Azhar, spent a year writing back and forth to finalize the document they signed on 4 February in Abu Dhabi on promoting “human fraternity” and Christian-Muslim understanding. “We have been working on this for a while,” Pope Francis said. “We have suspended some priests, sent them away for this, and – I’m not sure if the whole process had been completed – but we also have dissolved a few women’s religious congregations,” newer ones, where corruption and sexual abuse were found. The Catholic Church owes much to the “courage” of then-Pope Benedict XVI for beginning to tackle the problem, Pope Francis told reporters. As prefect of the Congregation for the Doctrine of the Faith, then-Cardinal Joseph Ratzinger tried to investigate a congregation where women were allegedly being abused, he said, but the investigation was blocked. Alessandro Gisotti, interim director of the Vatican press office, said the dissolved congregation was the Sisters of Israel and St John; he would not provide information about who initially blocked then-Cardinal Ratzinger’s investigation. “I interpret all gestures of welcome as gestures of goodwill,” he said. Every country designs the welcome ceremony according to its own traditions and culture.